Volume box for a tube amp’s effects loop – does it work? You may or may not have seen them, but on eBay there are always a few boxes for sale that claim to give you the full experience of your tube amp, but at bedroom level. The word ”attenuator” is also thrown in there, which makes these boxes turn up when you use that as a search term. And alongside the THD Hot Plate, Weber MASS and other (relatively costly) attenuators that turn up in the search results, the ”volume box attenuator” seems deceptively cheap. But what is it, and does it work? The power attenuator is the one most guitarists tend to associate with the word ”attenuator” – it goes between the power amp and the speaker, and lets you run the amp on 10 while keeping the physical volume down. This is sometimes called a ”power soak” (since it ”soaks” up some of the power). The ”line attenuator” sits after the preamp section in the amp and limits the signal level reaching the power amplifier. The amp’s master volume control is an example of a line attenuator, thus. Do not confuse the two types – if you buy the cheap ”volume box” version and connect it between the amp and speaker, you will fry both the box and your amp! …and by ”it” I mean the volume box (line attenuator). The power attenuator (Hot Plate, MASS etc) may be a more interesting device, but you can read up on those elsewhere 🙂 The volume box that you can buy for $10 on eBay is just that – a box with two jacks and a volume pot. That’s it. And it does indeed let you adjust the overall volume of the amp, by limiting the signal level returned to the amp’s effects return/power amp in jack. This assumes the effects loop is the series type – it will not work on parallel loops (since those only add the effected signal to the dry signal present in the amp). But it may let other parts of the amp work harder, so you may still notice a difference. For instance, on the clean channel (or the only channel, if yours is a non-master single channel amp), the level control is often located after the initial tube stage, but before a few other tube stages in the preamp. In those cases, it will let you crank the preamp tubes up – just like if you had a master volume available for the clean channel too. 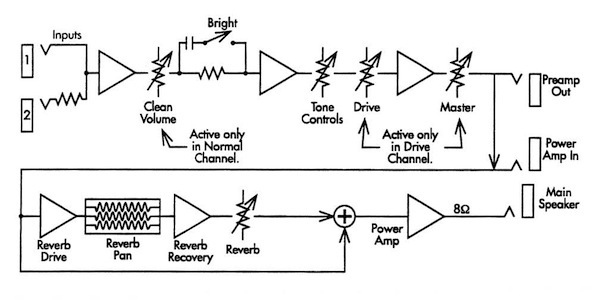 To make things more visual, let’s look at the block diagram from a Fender Blues/Hot Rod Deluxe. The volume box goes in the effects loop (between ”preamp out” and ”power amp in”). So if you turn the clean volume up, you will drive the following preamp tube and the tone stack harder. That can give you a nice gritty clean/semi dirty tone, which can then be kept under control with the volume box. It will also make the clean volume control less twitchy (it is well known that the clean channel on the Blues/Hot Rod amps very quickly jumps from ”barely heard” to ”very loud”). So in this sense it actually works, to a degree. Should you buy one, then? Well, why not? If it helps you get the tone you like, and as long as you know what you’re buying – that it isn’t anything magic, and that it won’t let you run the power amp any hotter than you’d normally do – have at it. And at the prices they usually go for on eBay, it’s hardly worth building your own – the parts alone (when bought in singles) can easily cost as much. What's inside the Dunlop Jimi Hendrix wahs?